For centuries saunas were the cornerstone of Finnish health and healing. Today, it is said that there are two saunas in Finland for every five people and they are not considered a luxury, but necessary for health and well-being. The traditional procedure for taking a sauna is to use extreme temperatures to rid your body of toxins and refine your pores. This means: profuse sweating in a scorching, aromatic sauna while hitting yourself with bundles of birch switches to open your pores, followed buy jumping into a hole in the frozen lake or rolling in the snow to cool your body temperature and close your pores. The Scandinave Spas are a Canadian spa group that brings the Finnish sauna traditions to Canadians and the hot/cold therapy to an accessible spa environment. There are three Scandinave spas in alpine locations: Mont-Tremblant, Blue Mountain, and Whistler, as well as one urban spa in Montreal. 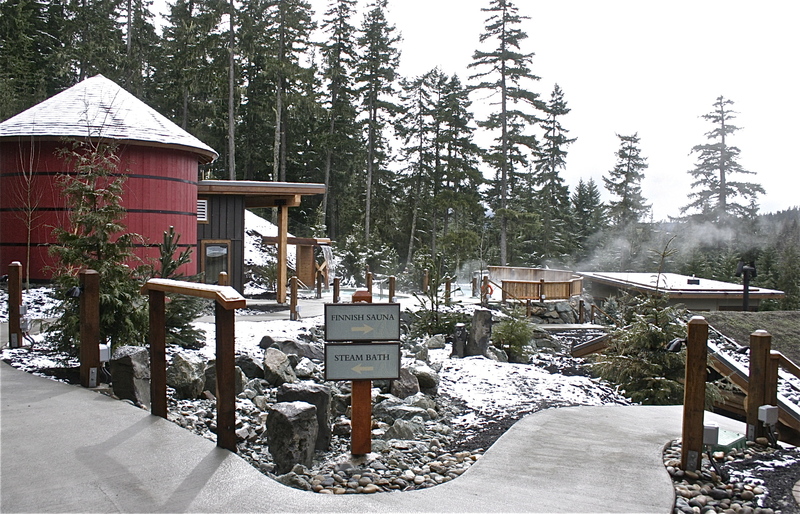 This winter I experienced two of the spas, Scandinave Blue Mountain in Collingwood, Ontario and the newly opened Scandinave Whistler in Whistler, British Columbia. Both prize their natural settings by creating views from the facilities to groves of trees and the surrounding mountains. The architecture is modern, but inspired by rustic Scandinavian tradition; the décor is warm, uncomplicated, and takes its cues from nature. The main attraction of the spas is the thermal hydrotherapy treatment. Which uses the traditional Finnish hot and cold procedure to stimulate healing in your body, smooth your skin and relieve stress. The facilities for these include a Finish sauna, a eucalyptus steam room, hot baths and cold pools. Spa staff will suggest partaking in one of the heat sources for ten to fifteen minutes then plunging into the cold water for a few seconds followed by a rest for ten or fifteen minutes. Ideally, you want to repeat this process three or four times for maximum health, healing and relaxation benefits. I recommend trying the three heat sources and then going back to your favorite. As a grand finale, or perhaps as an intermission, there is a massage pavilion on site offering various types of massage from registered massage therapists. The combination of thermal hydrotherapy and massage is not only relaxing, but also restorative. Though I found the spas to be very similar, there were a few notable differences. Blue Mountain: bigger “resting rooms” and more patio space with hammocks outside in the summertime. Outdoor fireplaces with chairs clustered around them to rest and warm yourself and a lovely campfire smell. The baths are on a comparatively flat surface, with far fewer stairs to climb and a very open view of the other baths. The shape of the spa complex is circular, so it focuses in on itself. There is easier access from the parking lot to the spa. Whistler: deeper cold plunges—gravity pulls you down into the water instead of you persuading yourself to crouch down into the water. The cold pools seem to be more conveniently located with quicker access from the heat source to the cold. The baths have more private nooks. The shape of the spa facility is a rectangle so the focus is away from itself towards the mountains. The drive there is along the Sea to Sky Highway and with its mountains, ocean, and shifting light, it is spectacular. My experiences at Scandinave Spas left my skin feeling soft, my body cared for, and my mind refreshed. The staff encourages a quiet environment and a leisurely pace. Bathing suits are mandatory and nothing else is necessary, though you may want to bring a pair of flip-flops, your own robe, and a friend to share the experience.